Decadent champagne afternoons, charming historical pubs, romantic castle tours and long drives across a stunning coastline. Voted one of the world’s top destinations in 2012, Belfast truly is a place reborn. I checked into Malmaison, a former seed warehouse converted into a boutique hotel. The heart and soul of every Malmaison hotel is the Brasserie where I indulged in delicious breakfasts. Iconic dishes are prepared here with a modern twist, including sublime steaks, the awesome MalBurger, and a mouthwatering wine list. The Belfast Bar indeed serves some of the best cocktails in town. We set out to explore the cultural heart of the city, the Cathedral Quarter with the beautiful St Anne’s Cathedral, the area packed with cobbled streets, little restaurants and great pubs. I stopped in at the renowned Merchant Hotel, a harmonious blend of Victorian grandeur and Art Deco-inspired sleek modernity. Post a browsing spell at Harper, an iconic exclusive fashion boutique, which is Northern Ireland’s only stockist of Valentino, Celine, and Christian Louboutin of Paris, we were ushered into a formal ornate space with red chairs and a great chandelier – the Great Room Restaurant — where awaiting us was an elaborate high tea with silver service and an assortment of sandwiches and melt-in-the-mouth patisserie including scones with clotted cream and strawberries. The Merchant Hotel sometimes couples these decadent champagne afternoon teas with fashion shows and pop up boutiques. Post tea, we drove though the Gaeltacht Quarter, home to some of the city’s most descriptive political and peace wall murals, the Queen’s Quarter with historical Queens University and the Ulster Museum. We even popped into a few pubs — the legendary Mc Hugh, one of the oldest pubs in Belfast dating back to 1711 and the Duke of York as well as the Dark Horse. The décor of a variety of beer bottles and antique Guinness glasses set up a delightfully quaint atmosphere. A glass of Guinness with a dash of cranberry was a perfect beginning at Deanes Deli, a bistro on a bustling street owned by Northern Ireland’s Michelin starred Chef Michael Deane. The next morning was spent at the Titanic Quarter visiting S.S Nomadic. This ship, considered Titanic’s ‘little sister’ was designed and built in Belfast at the same time as her famous sibling. Years of painstaking restoration have preserved her former glory and touch screen information panels, projected characters from Titanic’s heyday to recount the ship’s fascinating past. A short walk brought us across to the Titanic Belfast. This £ 97 Million colossus encases the dreams and disaster that is the story of Titanic. At the entrance is a giant TITANIC steel sign alongside a life size Titanic female figure. Nine galleries across three floors take you from the 1910 shipyard to the present – it was absolutely mesmerising. Post a lovely drive to the Culloden Hotel and Spa, set amidst 12 acres of beautifully landscaped, sculpture-dotted gardens, we decided to stop by Victoria Square, a shopper’s paradise, with over 130 shops and the Metropolitan Art Centre, the MAC, Belfast’s coolest venue, encompassing music, theatre, dance and art, local and international talent under one roof. After our walk through some art shows, the group headed to the Bar and Grill at James Street South. This takes inspiration from the first street houses of New York and I had a delicious steak cooked to perfection with house fries, ending with Irish coffee. The action-packed day began with a drive along the Causeway Coastal Route, known to be one of the top five road trips in the world. The journey starts in Belfast and follows through the Coast Road to the Larne Area, the getaway to the Nine Glens of Antrim. This area abounds with myths and legends of saints, banshees and bogeymen. We really enjoyed the stunning coastline with windswept cliffs, fabulous unspoilt beaches, historic castles, churches and forts. It brought alive all of my visions of a beautiful romantic Ireland. A quick detour to Belfast Castle, a magnificent sandstone building, allowed us to also see the old castle that is now opened up to host several A-list weddings and tea parties. We halted at the legendary Londonderry Arms Hotel at Carnlough for a quick pint of Guinness. An old coaching inn converted to a hotel, the Arms was actually bequeathed to Sir Winston Churchill in 1865! We then drove past the Bally Castle and halted at the Bushmills Distillery where the craft of whisky making has been carved out for over 400 years to create the best Irish whisky. You can even personalise a bottle here as a gift for someone back home! Then to a delightful café, gourmet grocer and a gift shop, The French Rooms, at Bushmills. Our next stop was Dunluce Castle – clinging fast onto a dramatic cliff top, Dunluce is thought to be the most romantic and beautiful castle in Ireland dating back to the 14th century. Icy winds froze every bone in my body, but I could not let go of this superb opportunity and I was cast in a medieval spell. Carrick-A-Rede Rope Bridge is a unique experience to traverse a 30-metres-deep and 20-metres-wide chasm by a rope that was traditionally erected by salmon fishermen. It was exhilarating, cold and awesome, with views across to Rathlin Island, Northern Ireland’s only inhabited island with a population of just over 100 people and home to thousands of sea birds. And then onto Ireland’s top tourist attraction, and UNESCO World Heritage site, the Giant Causeway. Formed over 60 million years ago when molten lava cooled on contact with water, it’s an awe inspiring landscape of mostly hexagonal basalt columns. I spotted the camel formation, the wishing chair and the harp. Folklore says, mighty giant Finn McCool, carved the causeway from the coast. Here, the £18 million visitor centre, an innovative state-of-the-art facility, provides visitors with a range of amenities. Gobbens Church is in the hamlet of Port Bradden, which has only seven houses. Originally a cow byre, the church building, is one of the smallest in Ireland where you can be wed if you have a guest list of only five! The day ended with a cosy dinner at the Causeway Hotel; steak and Guinness pie and champ (mashed potatoes with spring onions) and a glass of Baileys. The hotel, at the Causeway’s entrance has gorgeous views of the Antrim Coast. On our last lap of the coastal route, we drove through the Dark Hedges in Ballymony. It is a beautiful avenue with beech trees, planted by the Steward family in the 18th century and has become one of the most photographed natural phenomena in Northern Ireland. We proceeded to go through the breathtaking Ballyntoy Harbour, where Game of Thrones was filmed and finally our journey ended at the train station where I boarded the train to Dublin. Dublin is situated at the mouth of River Liffey. I checked into the Brooks Hotel, a designer boutique hotel located in the fashionable heart of Dublin City. Discovering myself just minutes away from Grafton Street, Ireland’s premier shopping area, I wandered around soaking in the flavours of Dublin. Pretty cafes, local bars, chic Irish boutiques, designer houses, international brands, people bustling everywhere. I then headed to Dundrum Town Centre, one of the largest shopping centres in Europe and then went on to see St Patrick Cathedral, built by the Normans in the 12th century. I met up with local friends, Antoinne and Jane, and we headed to the Irish House Party, in a lovely 18th century Town House, for a hearty Irish dinner, followed by traditional foot-tapping Irish music and dancing, and late evening drinks at the Vintage Cocktail Club. If one does not know about this bar one would never find it in Crown Alley — a little black door, no handle, just VCC mentioned above a small window. You ring the bell and are taken up the stairs to a cocktail club straight out of the 1920s. The Menu offered pages of exquisite hand-crafted cocktails and we did have a hard time making a selection! On a bespoke guided tour by LE COOL Dublin, our guide Michael ferretted out hidden historical gems, a pop up garden, street art, fashion and the latest trends. We saw Grogans Castle Lounge simply known as Grogans, an iconic pub, that has long been a watering hole for writers, cartoonists, painters…. Unlike other pubs it has no music but art on the walls and boasts of the best ‘toasties’ in Dublin. As we sauntered past the hip new bars, the trendy cafes and hip clothes shops that now line George’s Street. Michael pointed out Bruce Springsteen’s favourite bar, The Long Hall, an old elegant bar in a listed building which retains the design of an old style Dublin bar. Then to probably the smallest pub, Dawson Lounge. This tiny intimate retro bar with live music performances serves the traditional pint of black stuff. We learnt that pub culture has changed over the years — along with a few pints one gets excellent food too. We lunched at the Library Bar at the Central Hotel that combines the charm and elegance with modern facilities. Heading off on my own, I went across the city to the Guinness Store House, Ireland’s number one visitor attraction. It is located in the heart of St James Gate Brewery which has been home to the black stuff since 1759. The massive seven-storey building, a former Guinness Fermentation Plant has been remodelled into the shape of a giant Pint of Guinness. I learnt all I needed to know about the famous beer and could not resist a complimentary pint at the Gravity Bar, enjoying the 360 degree breathtaking view of Dublin at the same time. I joined the others at Dublin Castle where the Chester Beatty Library is located, described as one of the best libraries in Europe, the painstaking effort of one man, Sir Alfred Chester Beatty. Egyptian Papyrus texts, beautifully illuminated copies of the Quran, the Bible, European Medieval and Renaissance manuscripts were among the highlights on display. We started off with a bespoke Art Impression tour of the National Gallery of Ireland which holds the National Collection of European and Irish Fine Art. From there, for a walking tour of the Trinity College. 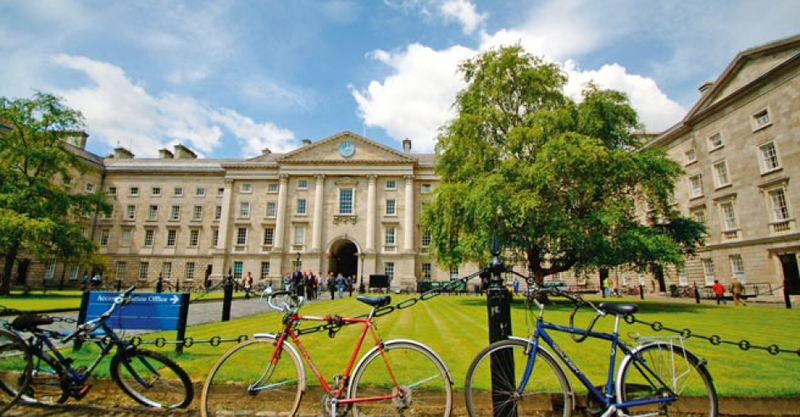 The oldest University in Ireland on its 40-acre site has lovely cobbled streets, gardens and parks. Among its many treasures is the Book of Kells, a ninth century illuminated manuscript. We walked past the Samuel Beckett Bridge in the historic, edgy dockland area. It is a moving bridge, shaped like an Irish Harp rotating through the air. At the hotel, The Marker, we noticed the rooms to be in a unique geometric layout. There is a relaxing spa and elegant dining areas, with the finale as a roof top lounge, which reaches across the cityscape to the mountains and the sea. Following a quick cocktail, Jane and I left for an exciting evening ahead. We had a pre theatre dinner booking at the sleek and elegant Chapter One Restaurant, which was furnished with textured fabrics and warm colours – a Michelin Starred restaurant, it serves Irish fare with an international touch. Here we were served wine from their acclaimed wine list where I had a braised shoulder of lamb with fried sweet breads, Irish strawberry with a yuzu and yogurt mousse, basil ice, brown bread and oat crunch, and dried milk topped off with their famous Irish Coffee. This gastronomic experience was followed by a performance of A Street Car Named Desire at the Gate Theatre housed in a beautiful historical building. Indeed, the ensemble and cast did complete justice to this classic and riveting performance. An eclectic mix of live entertainment across theatre, comedy, music and street performances. Almost 100 Dublin buildings of all types and periods open up their doors for citizens and visitors to explore the architecture of the city with special tours. An 18-day celebration of the best of Irish and international theatre.